Here are the most frequently asked questions about the Z1 and Z2 CPAP lines. Please note that most FAQs are relevant to both the Z1 and Z2. Click on the category to see a full list of questions. Or use the search bar to enter a question and search more quickly. Do I need to upgrade my firmware? How do I change the date and time on a newer CPAP? To change the date and time on your CPAP, go to the following link, and download the “Z1 Auto Firmware Upgrade” program onto a PC computer. Next, open the upgrader shortcut on your desktop, plug the Z1 into a power supply, and connect the Z1 to the PC using the USB cable that was included in your Z1 box. In the upgrader program, there is the option to “Set Date and Time”. How do I change the date and time on the Z1 Auto? You can change the date and time on your Z1 Auto, by connecting it to our Nitelog app on an iPhone/iPad or most Android devices. The app should prompt you to sync to the local date and time upon start up. If it does not, or if you accidentally hit “no” when prompted, swipe left at the main screen (that shows your Z1 screen) to access the settings menu. You can manually adjust the date and time on this page. Plug the Z1 Auto into a power source, and connect it to the PC using the USB-micro USB that was included in the Z1 box. Use the “Set Date and Time” button to adjust the date and time. Do not upgrade the firmware unless you are sure it is out of date. How do I change the pressure settings on my Z1 device? By law we are unable to distribute the instructions to change the pressure settings for patients. If you have questions on the appropriate pressure on your device, please contact your prescribing doctor and/or sleep specialist. If you are a prescribing doctor and/ or sleep specialist, call us at 855-436-8724 so we can send you the clinician’s manual. How do I change the ramp setting? Hold down the UP arrow until 00 minutes is flashing. Use the UP and DOWN arrows to choose the time you would like (5 minutes, 10 minutes etc.). Once your desired time is selected and flashing hold down the middle power button until the LCD screen reads “accept” (LCD screen should now show a bar graph in the top left-hand corner). Hold the DOWN arrow button until a pressure reads (will be flashing). Use the UP and DOWN arrow to adjust the pressure and then hold down the middle power button until you see the word “accept” on the LCD screen. Please note: you must set the ramp time before setting the ramp pressure. If the time is 0 minutes, it will not work. How do I change Z-breathe setting on my Z1? To change the Z-Breathe setting on your device, start with the unit in standby mode (reading 0.0 for the pressure). Simultaneously hold down the UP and DOWN arrow buttons until APAP or CPAP-2 is flashing. Use the UP and DOWN arrow buttons to adjust the setting and hold down the MIDDLE power button until you see the word ACCEPT on your screen. The unit will then return to standby mode. How do I get a product I purchased over the Internet changed over to CPAP mode instead of APAP mode (vice versa)? Your Z1 should have been set to the specific pressure(s) stated on your prescription. You will need to call the provider you purchased your device from to discuss this further, as they hold your prescription. If you want to bring your Z1 to your local doctor or licensed therapist, we can email them the Clinicians Manual with the instructions to set your device. How do I turn my Z1 Bluetooth on/off on my Z1 Auto? How do I download Dataviewer? DataViewer is only compatible with Windows based operating systems. Under the tab Software Downloads, click on Download DataViewer. Open the folder attached and double click on “HDM Data-Viewer-2.0.0-2.2”. A message will then pop up named “Compressed (zipped) Folders” and you will need to click on the button that reads “Extract all”. After that another message will pop up reading “Select a Destination and Extract Files”. Once you see that please click on the button that reads “Extract”. A folder will pop up again and you will need to double click on “HDM Data-Viewer-2.0.0-2.2”. You will then proceed to click on “HDM-Data-Viewer-v2_0_0_2-Setup”. From there a message will pop up and will read “Welcome to Install Shield Wizard for Human Design Medical Data Viewer” and you will need to click the “next” button. After that click on the Modify circle and continue hitting the “next” button until it reads “ready to modify the program” and click on the “install” button that is bordered with blue. Click the button that reads “Finish” which is outline in a blue color. The program should upload directly to your desktop and will read “HDM Data Viewer” and will look like a calendar with a bar graph on it with a red line across the top. Unplug everything and then re-plug it back into the machine. Restart your computer and open up DataViewer and try syncing device. If that does not work, try uninstalling and then reinstalling DataViewer and connect all parts back to computer and Z1 device. Hit F10, press “clear database” and then hit sync device. My screen isn’t reading 0.0 what should I do? When the Z1 is in stand by mode, the screen reads 0.0 in the pressure area. If the screen is not displaying 0.0 when turning your machine on, would indicate that it needs to be returned for repair. Please contact your provider, and they will advise you on what steps to take. The fan on my Z1 doesn’t seem to be working, what do I do? If the display screen shows your pressure, and the fan has not started blowing air within thirty seconds, then the blower has failed and the machine should be replaced. Please contact your provider and they will advise you on what steps to take. What does a Fail 1 code mean? The Fail 1 code means that you are hitting the power button while the motor is still running. It will happen when you hit the middle button repeatedly. What does a Fault 22 mean? A Fault 22 means that there is an SD card stuck in the SD port of your Z1 machine and needs to be removed from the device. Do not attempt to remove the SD card yourself. What does a Fault 33 mean? A Fault 33 is a defect in the unit and will need to be returned through the provider you purchased it from. Please contact your provider and they will advise you on what steps to take. What does a Fault 66 mean? A Fault 66 indicates your machine will need to be returned through the provider you purchased it from. Please contact your provider and they will advise you on what steps to take. What does an Error 18.8 mean? An Error 18.8 indicates that there is a defect with the display panel, and will need to be returned through the provider you purchased your machine from. Please contact your provider and they will advise you on what steps to take. What does REMINDER on my LCD screen mean? The word REMINDER indicates there is an excessive air leak somewhere. If it is happening while you have your mask on your face, please disconnect all parts to the Z1 including your mask and tubing (battery from the PowerShell, PowerShell from the machine, and unplug it from the wall). Reassemble the parts to the Z1. If the REMINDER reappears, the device will need to be returned. Please contact the provider you purchased your machine from to assist you. Can data be transferred from one device to another? No, the data cannot be transferred from one device to another. Data on the Z1 will be stored for the usage on the actual unit itself. Do I have the latest firmware downloaded on my machine? In order to check the firmware on your device, start up your machine and the second set of numbers flashing is the firmware you currently have downloaded on your device. The latest firmware available is 2.1.0.5. If you have further questions, please call us at 855-436-8724. Ext. 110. The firmware upgrade posted on our website is for the black Z1 Auto only. Please do not use this firmware upgrade on a white Z1 CPAP machine. I have a torn outlet tube, what do I do? The Z1 must be returned to replace the silicone outlet tube. Please contact the distributor you purchased your Z1 from, and let them know your unit needs to be returned to the manufacturer. I just purchased a Z1 auto, my boat has a 12 volt system. Can I use it to power the Z1 auto? The PowerShell auxiliary plug is designed to work with 12v systems. If the system drops below 12v the system may shut off. Is there a way to dim the green light on the LCD screen? The dim light is on a timer and should turn off after a few moments. Unfortunately, there is no way to change the timer on the backlight of the LCD screen. What is the minimum voltage needed to charge my Z1? The minimum voltage you will need to charge your Z1 device is 12 volts. What is the SoClean and how does it work with my Z1? It is an activated oxygen cleaning system that completely sanitizes your CPAP without any water or chemicals and kills 99.9% of all germs and bacteria in the hose and mask. Please see the attached video on how to connect your Z1 device to the SoClean machine. What is the voltage needed to run the Z1? The Z1 runs on electricity from 100-240V which means you will not need a converter for international travel. You will only need a plug adapter to fit the right configuration for the country you are visiting. What size tubing can be used with the Z1? Our tubing comes in two different lengths- 4 feet and 6 feet slim style. They are 15 mm in diameter. You can use standard tubing with the Z1, which is 19-22 mm diameter. Why is my pressure spiking up when I use my Z1? The most common cause of a pressure increasing, beyond what is necessary, is a leak in the system/mask. It may be a leak in the connections to the mask, or the hose. Please check to make sure these connections fit tightly. Another reason is an excessive leak at the mask. Please make sure you have a proper seal between the mask and your face. Check the connection of the tube adapter and the outlet tube (the rubber piece where the tube adapter connects to the machine). If the tube adapter is not properly seated in the outlet tube, the pressure sensor may not be getting the information it needs to regulate the pressure. Also check to make sure your outlet tube is not torn. If it is torn, the device will need to be returned to be repaired. The last reason could be the Z1 may be sensing an obstruction, which reads as an apnea, and thus increasing the pressure. This could be caused by congestion, or a mask system that has very low flow rate. If you have a mask with very low flow rate, such as some of the very small nasal pillow masks, you may want to try a mask with less restriction such as a nasal mask. If none of the above are successful, please contact the provider you purchased your Z1 from. Am I at risk for rebreathing? No, you are not at risk of rebreathing as long as your mask has an exhalation port and your device is turned on. How long does an HME last? There are several variables that determine how long your HME will last. Your pressure setting, how often you use the HME, and how you store it. It is recommended that the HME is stored in an airtight container/zip lock bag when not in use to help it last longer. The estimated time is 7-30 days depending upon the variables listed above. If you feel it is not providing enough humidity, it is time to replace the HME. The HME doesn’t give me enough moisture, what can I do? To get more humidification, I would recommend getting a lubricating nasal spray, nasal gel, or an in-room humidifier at your residence or hotel. What is a Heat Moisture Exchanger (HME)? The Heat Moisture Exchanger (HME) is a portable humidifier that provides humidification during therapy. The HME works by capturing moisture into the blue sponge as you exhale, and when you breath in, it delivers the humidity back to you. Where do I install an HME? 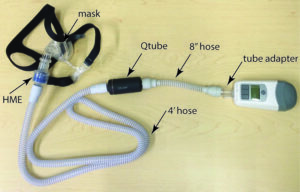 The HME connects between your mask and your tube. The HME is not as effective unless it is connected right at the mask. For those who have an extension tube as part of their mask, the HME is less effective because the humidity you are exhaling will not reach the HME. Please see the attached picture. How do I connect to the Nitelog app? Please follow the steps below to connect to the Nitelog App. Make sure your Bluetooth is turned on in your phone. Download Nitelog from the app store onto an iOS (Apple) mobile device (iPhone or IPad), or Google Play store for Android phone or tablet. (Nitelog must be one word). Fill in your name under the Legal Disclaimer form, if you want your name on the compliance reports so you can send them to your healthcare provider. If not, you can remain anonymous. Read the document (software end-user license agreement) and click on “I agree” if you accept. Open the application, and press on the plus sign (+) in the top left-hand corner. An option will appear that reads Z1 with four digits after it (example: Z1 1234). The 4 digits are the last 4 digits of the (S/N) serial number shown on the back of the unit. Click on the white bar that shows “Z1 XXXX” (last 4 digits of serial #) to the left of the word “disconnect” to sync the device. The disconnect button is used if you no longer want to pair with the device after connecting. It will then ask you to “enter your password”. Click on update password and enter any 4–8 digit number. This is so others cannot pair with your device and see your data. If you forget your password, click on update password to reset. After saving the password, there will be a 20 second countdown on your phone and Z1. Hold down the middle power button of the Z1 during the 20 second countdown to pair the Z1 and phone. A message will appear asking if you would like to change the time to your local time zone. Make sure you set your time zone to ensure the data is accurately recorded. How do I view my chart settings in Nitelog? In the top right hand corner of the Nitelog app you will see a settings icon (looks like a tire or gear) click on it. Options will appear with different settings. Under compliance settings make sure the “compliance range in months” is set to 12 months (set the “compliance day window” / “required days” and “minimum hours usage per day” to the max settings by using the plus sign). I can’t view my data on Nitelog, what should I do? Your viewing window may be set incorrectly. To fix this, go into chart settings by using the gear icon in the top right corner of the main Nitelog screen. Change your usual sleep time to the time you normally go to sleep and change the hours of sleep to 12. You should now be able to view your data for the night selected. On the last day of each month, the Z1 Auto only ‘logs’ the time used between the start of usage and midnight. It does not report any time between midnight, and morning of the first morning of the month. Is there a fix to this problem? Your viewing window may be set incorrectly. In order to fix this, go into chart settings by using the gear button in the top right corner of the main Nitelog screen. Change your usual sleep time to the time you went to sleep and change the hours of sleep to 12. You should now be able to view your data for the night selected. Can I run/charge the PowerShell battery using a DC Mobile Adapter? No, you cannot run your Z1 on a DC mobile adapter however, it can be used to charge the PowerShell. We cannot guarantee the mobile adapter will function with all cars, as battery voltage isn’t uniform. How do I keep my fully charged battery from losing charge while not in use? Once the battery is fully charged, please disconnect your Z1 machine from your PowerShell and remove the battery from the PowerShell, or it will slowly drain the battery over the course of 2-3 days. My PowerShell is not charging, what do I do? Make sure you hear a clicking noise when inserting the Z1 into the PowerShell. If it is still not charging disconnect the Z1, battery, and power supply and reconnect. Proceed to recharge your unit again for 10-12 hours. If it is still not holding a charge it will need to be sent in for a return by the provider you purchased your unit from. Disconnect the battery from the PowerShell after a full charge to prevent the battery from slowly draining within a 2-3 day period. The battery needs to be charged for 10-12 hours to ensure a full charge. The bars of battery life on the LCD screen need to be full, and not blinking. The PowerShell will not hold a charge while using the Z1 for treatment, it must be charged separately. The PowerShell cannot be charged while using the Z1 for treatment. Do you work with any insurance providers? We do not bill insurance. We suggest that you contact your insurance provider to inquire about reimbursement for your CPAP device and use HCPCS code E0601. Does the Z1 have HCPCS codes? Yes, the HCPCS code is E0601. If you are submitting for reimbursement use the E0601 code. The PowerShell battery system does not have a HCPCS code. Please follow the link to find the nearest distributor in your area or call us at 855-436-8724. What does Z1 come with? The Z1 system includes: Z1 device, tube adapter, 4 ft. slim-style tube, power supply cord, custom USB cable, HME (travel humidifier), 2 air filters, the User Manual, and the Getting Started Guide. It does not come with a mask. Most people use the mask they are already comfortable with. What is the difference between BIPAP and CPAP? What is the difference between the Z1 Auto and the Z1 CPAP? A fixed pressure CPAP device provides a fixed therapeutic pressure. An Auto adjusting CPAP provides a variable therapeutic pressure throughout the resting period. The benefit of an Auto adjusting machine is that it changes with your varying pressure needs resulting in a 40% reduction in mean pressure. What is the warranty on the Z1? The warranty on the Z1 is three years from the date the patient purchased the unit from the reseller, with their receipt. If the patient does not have a receipt, the warranty period starts from the time the DME purchased the device plus a two-month grace period. Why should I choose the Z1 device over another device? Please contact us at 855-436-8724, and we would be happy to discuss why the Z1 is, or is not, an appropriate choice for you. Will a BIPAP prescription work for a CPAP machine? No, a BiPAP prescription is specific to a BIPAP machine and cannot be used for a CPAP machine and vice versa. You will need to discuss this with your doctor if you would like to purchase a CPAP device. The Q-tube is an inline CPAP muffler that helps mitigate the wind noise one may hear in the mask. Can you use the CPAP on an airplane? Yes, the Z1 CPAP is FAA compliant for use on airplanes. I have attached the FAA compliance letter to present to the airline if need be. Do you sell solar chargers? No, we currently do not sell solar chargers. Additionally, we are not aware of a solar charger that works with our device. Will the Z1 work at an elevation above 8,000 ft.? Our units have been tested for up to 8,000 feet. We cannot guarantee the operation of the device above 8,000 feet.